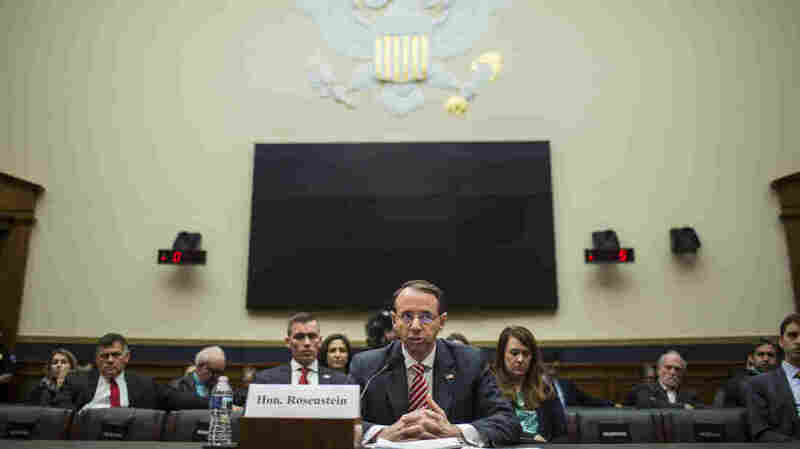 Rosenstein Defends Mueller, Justice Department Amid Attacks About Bias GOP critics say Mueller has run amok and is on a biased fishing expedition out to get President Trump. They want a new special counsel, but the Justice Department says its own process is working. Deputy Attorney General Rod Rosenstein testifies during a House Judiciary Committee hearing on Wednesday in Washington, D.C.
Republicans pummeled the FBI and Justice Department on Wednesday as they continued painting its special counsel, Robert Mueller, as the boss of a partisan fishing expedition rife with Democratic sympathizers that is out to get President Trump. But Deputy Attorney General Rod Rosenstein resisted the fishing expedition narrative and told the House Judiciary Committee that Mueller is not off inside a locked room hidden from his view, but instead is consulting with him about the directions his team wants to travel. "I know what he's doing," Rosenstein said. "If I felt he was doing something inappropriate, I would take action." The deputy attorney general also reminded the committee that he retains the authority to fire Mueller if he sees fit — but only for what he said is "good cause." Asked what he would do if Trump ordered him to fire Mueller, Rosenstein said he would evaluate that question on its merits. "If there were good cause, I would act. If there were no good cause, I would not." Committee Chairman Bob Goodlatte, R-Va., cited hundreds of text messages between two FBI agents who reacted to political events last year with contempt for then-Republican candidate Donald Trump and support for Democratic rival Hillary Clinton. One senior special agent, who was a part of the Clinton email server investigation and then became part of the counterintelligence investigation into the Trump campaign and its potential ties to Russia, was removed from Mueller's team. The two FBI employees "clearly let their strong political opinions cloud their professional judgment," Goodlatte charged. But that isn't all, he said; the presence of attorneys who have given campaign contributions to Democrats or made comments critical of the president meant the Mueller team has begun to "look more and more partisan." Rep. Steve Chabot, R-Ohio, read what he said was an alphabetical list of campaign donations from people on Mueller's investigative team — one he said heavily favored Democrats. Justice Department employees are permitted to make such contributions and to express their political views, which are barred by the department's official rules from being considered in evaluating their work. But that is ridiculous, critics charge. "How, with a straight face, can you say this group of Democrat partisans are unbiased and will give President Trump a fair shake?" Chabot asked. "I would submit the Mueller team ought to be attired with Democratic donkeys or 'I'm with Hillary' T-shirts ... and I think it's really sad." Rosenstein defended the Justice Department and the FBI, as the bureau's director, Christopher Wray, did at a similar hearing last week. The Justice Department is evaluating whether to appoint a second special counsel to look into some of the matters raised by Republicans, Attorney General Jeff Sessions has said. But neither Sessions nor Rosenstein have given a strong sense about what they might ultimately decide. Wray told the House Judiciary Committee last week that the Justice Department already is doing an outside investigation into the handling of the case of Clinton's private email server while she was secretary of state. Its inspector general's office, doing that work, uncovered the text messages that Goodlatte cited, Rosenstein said. Rosenstein told members of Congress on Wednesday to let that process move ahead before he and they decide what action to take, if any. The findings would be ready "in the next couple of months," he said. The anti-Trump text messages, and other examples of what Republicans call bias, have fueled a coordinated campaign by Republicans to try to damage Mueller and his office as much as possible. Personal lawyers for Trump also have gone on offense, charging the Justice Department and the FBI with bias and calling for another special counsel. The committee's top Democrat, Rep. Jerry Nadler of New York, said Republicans are threatening to go beyond normal partisanship and seriously damage respect for the Justice Department and the rule of law. How much worse might it get, he asked, if Mueller brings more indictments against people in the Trump orbit? "I understand the instinct to want to cover to the president," Nadler said. "I'm fearful that the majority's effort to turn the tables on the special counsel will get louder and more frantic as the walls continue to close in around the president." Other Democrats pressed Rosenstein about his commitment to follow the law and proper procedure in case of pressure to fire Mueller. The rising temperature of the criticism from Republicans and the heavy focus of the charges of bias have prompted Mueller supporters to worry that Trump again may be considering removing him. "I am not going to be discussing my communications with the president, but nobody has communicated to me the desire to remove Robert Mueller," Rosenstein said. He did acknowledge that he talks with Trump frequently in the course of his Justice Department duties, but in response to questions from Rep. Eric Swalwell, D-Calif., Rosenstein said he had never spoken with Trump in a one-on-one meeting. Former FBI Director James Comey had said that Trump used such meetings to ask him for his personal loyalty and, later, to lay off of the FBI investigation of former national security adviser Mike Flynn. Flynn has since pleaded guilty to lying to the FBI; Trump has denied all along that he ever asked Comey for such a pledge or to go easy on Flynn. But Swalwell told Rosenstein that it's because Americans can't know exactly what goes on behind closed doors in Washington, D.C., that he must commit to resist pressure to get rid of Mueller. "We need you to be fearless," he said.